It’s been a rough week for the Clippers, who lost star center DeAndre Jordan to the Mavericks—in part because Chris Paul might be a nightmare to play with, and in part because Jordan sees L.A.’s long term-viability is in doubt. 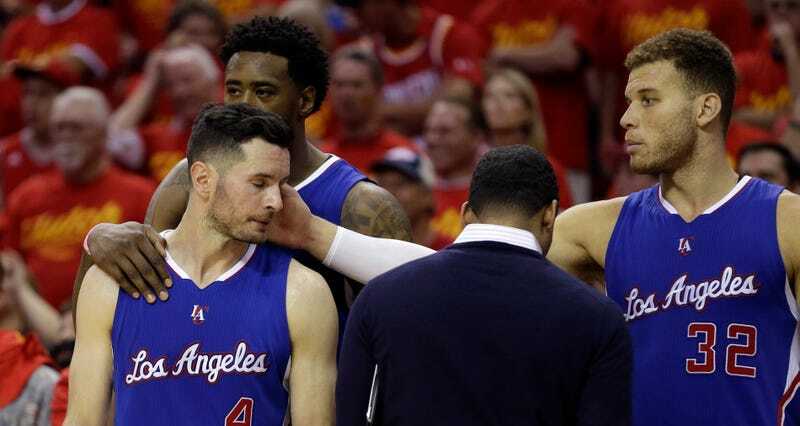 Now, Doc Rivers will tell you he’s a great GM, and that any time anything bad happens it’s not his fault, but Clippers guard J.J. Redick says there’s no way to call this offseason anything but a disaster. In an interview with Bleacher Report Radio, Redick awarded the Clips’ free agency an “F” grade. Only because he wasn’t sure if he could go lower. “Is there an F-minus?” Redick asked. To be fair, Redick was talking specifically about the loss of Jordan. The Clippers did acquire Paul Pierce and Lance Stephenson, which should bump Redick’s grade back up to an “F.” And his comments came before the team agreed to terms with Wesley Johnson, so that changes everything. This is an offseason of sadness.